OK, I have to share a 2010 Knapp Family Reunion story of my own. My stepson flew in from Atlanta last week (Thursday) so he could attend the reunion. When he awakened on Friday morning, he had an unexpected roommate. It seems a tree frog somehow got into his room and was “walking” all over the walls and ceiling. He (at least I think it was a “he” – how one can tell with a tree frog I don’t know) was quite a lively tree frog – and it was pretty funny watching my husband and his son both chasing the frog around the room. Mark finally caught him and released him harmlessly in the front yard. Now – this isn’t the first tree frog we have found in our home during the past year. In fact – it isn’t even the second. This is the THIRD tree frog we have seen inside the house. The first one we noticed while we were sitting in the living room. Mark noticed a dark spot on the carpet. He asked me what it was, I went to look and suddenly, whatever it was – it MOVED! A few weeks later, I was upstairs getting ready for work. Mark was making a pot of coffee in the kitchen. Suddenly, I heard Mark make a funny noise. It was the kind of noise your husband makes that you know isn’t good – like a gasping kind of noise. There was a (you guessed it!) tree frog sitting perched on the kitchen faucet! Mark didn’t see it until he went to fill the coffee pot. That will wake you up pretty quick before you’ve had your first cup of joe, let me tell you! The really funny part is that our pastor has been preaching for the past few weeks on the story about the plagues that God unleashed on Egypt after Pharoah wouldn’t let God’s people go – and, you guessed it – the second plague just happened to be frogs! We still don’t know how the frogs are getting indoors, but hopefully we’ll figure it out. And here is a photo that my stepson shot with his cell phone camera and emailed to me. Click on the thumbnail photo to the left to see a larger photo of his new “roomie” who we relocated outside this week! 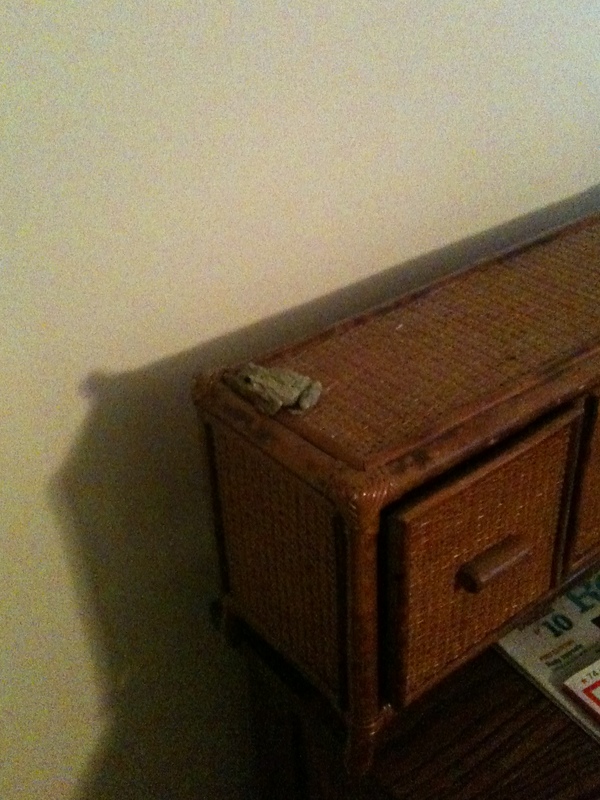 This entry was posted in Stories and tagged Knapp, tree frog story. Bookmark the permalink.